Perseverance is about setting an intention to shift our perception, learning looking at things with a new perspective, and believing that things can change so much that you are willing to make the change. 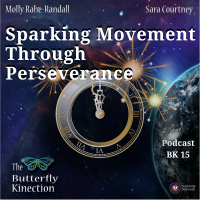 Molly and Sara discuss how we can spark movement in our lives by persevering through situations or through self growth. What do I like that is going on in my life? What can I be doing differently to live a more fulfilling life? Learning to persevere is a process that requires patience, faith and self love. So many times, we are in such a hurry to get to the finish line that we forget that there is so much to learn along the way. Perseverance is the process that we must be willing to take to get to the finish line. The finish line is the victory. Soul growth continues as we allow ourselves to continue growing. Our souls come here to learn and grow. If we fall into a place of complacency or feeling stuck, we stunt our soul growth. The willingness to continue to grow adds a spark to our life. Perseverance is about living in the moment. Living in the now. If we have faith and trust, we give our soul the catalyst or kinetics it needs for growth. Molly and Sara discuss how the kinetics of our soul will give us wings to fly. For more of The Butterfly Kinection, follow us on Facebook and our website.